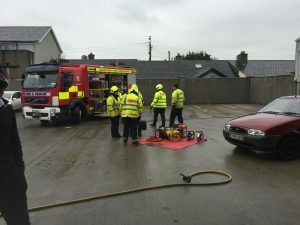 Fifth Year students in Tyndall College were excited this week after their trip to the Local Fire Station. 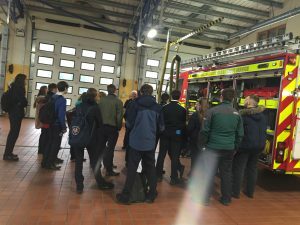 The students received a fantastic tour of the Fire Station and an in-depth talk on the work carried out by Fire Fighters on a daily basis. 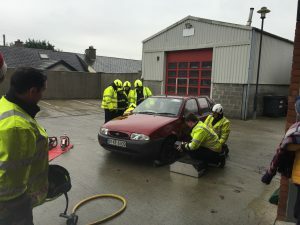 They were shown the fire engines and got a full explanation of them and their capabilities when fighting fires and rescuing people in road accidents or collisions. They were then brought upstairs to the meeting room where they received very informative information on road safety and the importance of staying within the speed limit to avoid mobile phone usage while driving. And staying well behind the person behind you. Students were briefed on being very aware of what’s going on around them when driving and to always wear their seatbelts. Students were shown pictures of road traffic accidents and showed how they rescue victims and how time is of the importance in situations where a persons life is at risk. 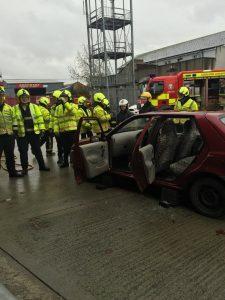 Students were then given hand on experience of dismantling a car which demonstrated what it was like if there was accident and how they go about their jobs. The highlight of the trip was that all students got to travel back to school in style in the Fire Engines. The fire fighters job wasn’t over as they got us all back in one piece. It was a fantastic experience and the students really got a hands on experience of what its like to be a fire fighter and the important role they play in our community.